CTLA-4 (cytotoxic T-lymphocyte antigen-4), is a negative regulator of immune activation that is considered a foundational target within the immuno-oncology market. In 2018, the Nobel Prize in Medicine was awarded for the establishment of CTLA-4 as a cancer immunotherapy target. Agenus has applied these scientific findings to create a therapy designed to treat cancer, AGEN1884. AGEN1884 is a fully humanized monoclonal antibody that activates the immune system to destroy cancer cells by blocking the interaction between CTLA-4 and its binding partners CD80 and CD86. AGEN1884 is clinically active in patients with advanced or refractory cancer. In fact, we have seen a complete and durable response in a patient with refractory angiosarcoma. This patient was profiled in the news. Agenus’ CTLA-4 is in clinical trials as a monotherapy and a combination with our PD-1, AGEN2034 in an ongoing Phase 1/2, open-label, multi-arm trial to investigate the safety, tolerability, pharmacokinetics, biological and clinical activity of this regimen in patients with metastatic or locally advanced solid tumors including refractory cervical cancer. AGEN2034 is a novel, fully human monoclonal immunoglobulin G4 (IgG4) designed to block PD-1 from interacting with its ligands PD-L1 and PD-L2. AGEN2034 is clinically active in patients with advanced or refractory cancer. 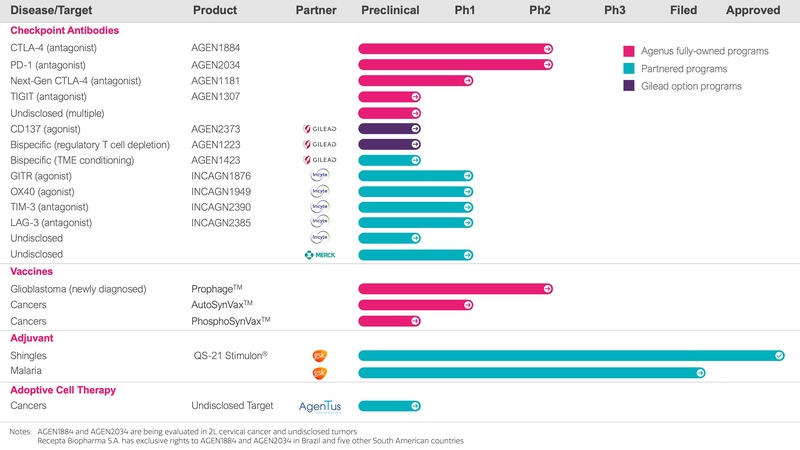 Agenus’ PD-1 is in clinical trials as a monotherapy and a combination with our CTLA-4, AGEN1884 in an ongoing Phase 1/2, open-label, multi-arm trial to investigate the safety, tolerability, pharmacokinetics, biological and clinical activity of this regimen in patients with metastatic or locally advanced solid tumors including refractory cervical cancer. AGEN1181 is a next-generation “Fc-engineered” anti-CTLA-4 antibody with enhanced tumor fighting abilities, designed to generate responses in a larger number of patients and improve immunogenicity. To develop AGEN1181, Agenus leveraged the above discovery to modify a part of the antibody known as the Fc region, which interacts with other immune cells to enhance antitumor immunity. In pre-clinical studies, this “Fc-engineered” antibody significantly improved the cross-talk between antigen presenting cells (APCs) and T cells. In cancer immunotherapy, such an interaction is necessary to mount a potent immune response against cancer. AGEN1181 is expected to enable deeper single-agent responses and superior combination potential. Clinical trials of AGEN1181 in patients with solid tumors are expected to begin in 2019. TIGIT is a negative regulator of innate and adaptive immune responses. AGEN1307 is a fully human monoclonal antibody that boosts the immune response to cancer cells by blocking the interaction between TIGIT and its binding partner CD155. Moreover, AGEN1307 is one of our next-generation antibodies which has been “Fc engineered” to maximize antitumor activity (see AGEN1181). Therefore, we expect that AGEN1307 will bring clinical benefit above and beyond that of conventional anti-TIGIT antibodies. TIGIT signaling has also been identified as a key resistance mechanism to anti-PD-1 therapy, suggesting that AGEN1307 can address therapeutic resistance to anti-PD-1 therapy. CD137 (4-1BB) is a positive regulator of the immune system that is highly upregulated on activated T cells (adaptive immune cells) and NK cells (innate immune cells). The potential to dually target innate and adaptive immunity makes CD137 a highly attractive target for cancer immunotherapy. AGEN2373 is a fully human monoclonal antibody that boosts the immune response to cancer cells by enhancing CD137 co-stimulatory signaling in activated immune cells. Importantly, the unique binding properties of AGEN2373 are expected to limit its activity outside of the tumor site and mitigate toxicities that may be associated with systemic activation of CD137 in humans. With preclinical studies supporting safety and efficacy of AGEN2373, we are poised to initiate first-in-human studies in 2019. Bispecific antibodies are engineered to simultaneously bind two different antigens. They can be used to tailor the binding dynamics and effector functions of antibodies to specific cell types. We are developing two bispecific antibodies based on highly innovative strategies to combat tumor escape mechanisms. AGEN1423 combats two prominent resistance pathways for cancer immunotherapy. These pathways are present across many tumor types and are associated with poor responses to checkpoint blockade and other treatments. Notably, this agent has the potential to enhance the antitumor activity of myeloid cells, NK cells, T cells, and cancer associated fibroblasts. We expect our bi-specific program to move into the clinic in 2019. GITR is an immune checkpoint agonist, one of a class of receptors that amplify the immune system’s response to cancer. GITR (glucocorticoid-induced TNFR-related protein) is a receptor expressed on select populations of T cells. Activation of GITR leads to a more powerful anti-tumor inflammatory response, increased production of inflammatory signaling molecules and increased resistance to immunosuppression. OX40 (also known as CD134 and TNFRSF4), a member of the TNFR super-family, is an immune-response-enhancing receptor found on activated T cells. OX40 promotes proliferation of these activated T cells and prevents the immunosuppressive activity of inhibitory T cells. We believe that antibodies that activate OX40 may help increase immune system activity through both of these mechanisms. Furthermore, OX40 antibodies have the potential to work alone or in combination with other therapeutics. Our INCAGN1949 antibody targeting OX40 is part of our global alliance with Incyte. The program is funded by Incyte with Agenus eligible for potential milestones and 15% royalties, subject to reduction for certain third party obligations. INCAGN1949 is currently in Phase 1 / 2 clinical trials (www.clinicaltrials.gov). TIM-3 is a checkpoint receptor found on certain immune cells. TIM-3 stands for T-cell immunoglobulin and mucin domain-3. To prevent hyperactivation, natural ligands binding to TIM-3 reduce the activity of these immune cells. In some types of cancer, T cells express elevated levels of TIM-3, which results in excessive immune suppression. Blocking TIM-3 could stimulate immune responses and promote immune-mediated clearing of cancer cells. TIM-3 antibodies may have a role as a monotherapy and hold great potential in combination therapy, since they may help overcome resistance that patients may develop against other therapeutics. Our TIM-3 checkpoint inhibitor is part of our global alliance with Incyte. The program is funded by Incyte with Agenus eligible for potential milestones and royalties ranging from 6-12%, subject to reduction for certain third party obligations. 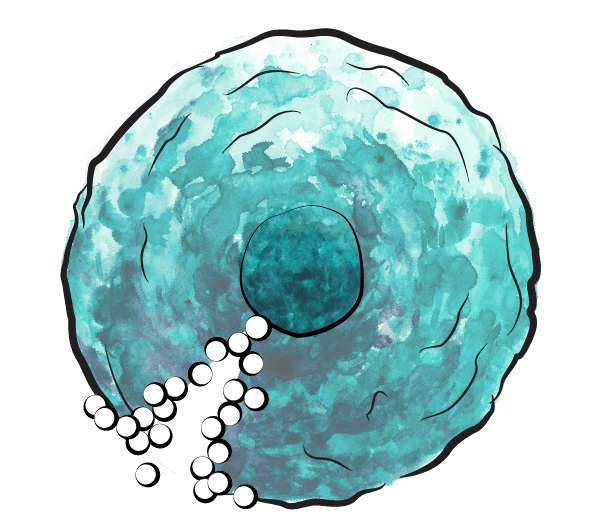 LAG-3 is a checkpoint protein expressed on the surface of certain cells of the immune system. LAG-3 (lymphocyte-activation gene 3) modulates signaling between immune cells and their targets. 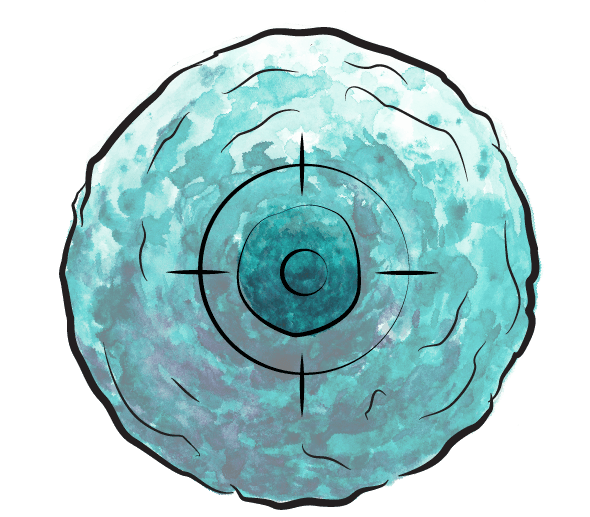 When LAG-3 is activated, the immune response is suppressed. Antibodies that block LAG-3 can block this inhibitory signal, thereby boosting the immune system’s response against cancer cells. LAG-3 acts synergistically with other checkpoint modulators. This suggests antibodies against LAG-3 may be valuable as combination therapies . This is why we believe our LAG-3 checkpoint inhibitor may have potential in both combination and monotherapy settings. Our LAG-3 checkpoint inhibitor is part of our global alliance with Incyte. The program is funded by Incyte with Agenus eligible for potential milestones and royalties ranging from 6-12%, subject to reduction for certain third party obligations. The immune system has the capacity to “see” cancer antigens or mutated molecules on cancer cells as foreign or abnormal and unleash an attack that destroys these cancerous cells. However, the number of mutations varies from one patient’s tumor to another. Current research suggests that our natural immune defense mechanisms may be insufficient to eliminate cancers in cases where mutations are too few in number. Even when cancer cells display many mutations, they can evade effective recognition by the immune system through a variety of immunosuppressive mechanisms. Agenus’ AutoSynVax cancer vaccine is being designed to boost immune recognition of cancer antigens to a higher level than that which is achieved naturally. The vaccine therefore may help the immune system better recognize cancer antigens even if there are only a small number of them on a given patient’s tumor. AutoSynVax is expected to work synergistically with other forms of immunotherapy including checkpoint inhibitors and other checkpoint modulators that counteract immune evasion mechanisms. AutoSynVax is an individualized vaccine made by combining synthetic versions of each patient’s own cancer antigens with heat shock protein 70 (Hsc70). 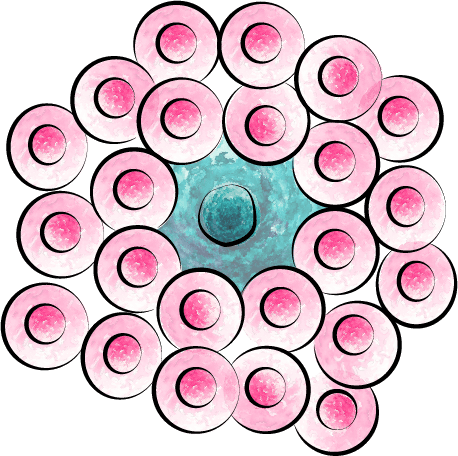 Hsc70 is known to transport protein fragments called epitopes and to play a part in displaying them to T cells, immune cells that, when sufficiently activated, can mount a potent anti-tumor response. We identify the unique genetic sequence of an individual patient’s cancer and apply proprietary computational tools to predict which mutations, unique to that patient, are likely to be displayed by the tumor in the form of “neo-epitopes.” Accurate prediction of these neo-epitopes increases the likelihood that our AutoSynVax vaccine will stimulate a robust T cell response against tumors. We then synthesize these neo-epitopes in the form of short peptide sequences. After linking these peptides to Hsc70 in our GMP-certified manufacturing facility, AutoSynVax vaccine is administered along with our QS-21 Stimulon® adjuvant to provide maximum efficacy. By including numerous synthetic cancer antigens in each patient’s AutoSynVax vaccine, we increase the likelihood that tumors will be recognized by the immune system. Our PhosphoSynVax vaccine platform is based on technology we obtained when we acquired PhosImmune. PhosphoSynVax is being designed to induce immunity against a novel class of tumor specific neo-epitopes: those arising from inappropriate phosphorylation of various proteins in malignant cells. In cancer cells, the disruption of normal biochemical signaling can result in aberrant protein phosphorylation (the addition of phosphate groups on sites that would not be altered in normal cells). Some of these misphosphorylated proteins can be processed into antigens by the cellular machinery, resulting in presentation of this new type of antigen on the cell surface. We have a library of more than one thousand proprietary phosphopeptide tumor target antigens characteristic of many different cancers, including lung cancer, specific leukemias, ovarian cancer, colon cancer and others. We believe that using our PhosphoSynVax vaccines to teach the immune system to recognize these neo-epitopes can lead to the destruction of cancer cells. This technology is thus unique to Agenus and potentially very powerful in various patients across cancer types. The Prophage vaccine platform involves extracting peptides (protein fragments) from a patient’s tumor that are naturally bound to heat shock protein gp96 (HSPPC-96). Subsequently, Prophage is designed to mobilize multiple immune processes to attack the tumor. The National Cancer Institute is currently conducting a clinical trial to evaluate Prophage vaccine in conjunction with Merck’s pembrolizumab on the overall survival rate of patients with newly diagnosed glioblastoma (ndGBM), a form of brain cancer. The standard of care treatment for glioblastoma is surgical resection, when possible, followed by radiation and chemotherapy. With today’s treatments, the vast majority of patients survive only 16 months or less. At ASCO in June of 2015, we reported results from a single-arm, open-label, multi-institutional Phase 2 trial of Prophage in ndGBM in combination with the standard of care treatment of surgical resection, radiation therapy and temozolomide chemotherapy. We reported that patients with ndGBM had a substantial improvement both in progression-free survival and overall survival with Prophage combined with standard of care compared to historical control data. In addition, it was found that the most significant improvements (median progression-free survival approximating 27 months, median overall survival approximating 44.7 months) were seen in the seventeen patients with less elevated expression of the checkpoint protein PD-L1 on the circulating cells known as peripheral blood monocytes. This suggests that patients who are thought to be less immuno-suppressed when first diagnosed with ndGBM could benefit from adding Prophage vaccination to standard of care. It also raises the possibility that Prophage may be beneficial in the other half of patients who are more immuno-suppressed (those who have greater PD-L1 expression on peripheral blood monocytes at baseline) by adding checkpoint modulators that block PD-1 or PD-L1 to Prophage plus the standard of care. QS-21 Stimulon® is a key component in several GSK vaccines, including the most efficacious shingles vaccine, Shingrix®, which has demonstrated >90% efficacy, as well as the first ever malaria vaccine, Mosquirix®. QS-21 Stimulon® improves a vaccine’s effectiveness by inducing strong antibody and cell-mediated immune responses. It also plays a key role by boosting immune response in older adults who often experience age related decline in immunity. In October 2017, the U.S. Food and Drug Administration (FDA) granted marketing authorization to GSK for Shingrix® for the prevention of shingles in adults aged 50 years and older. The Center for Disease Control and Prevention recently declared Shingrix® as the preferred shingles vaccine for approximately 62 million eligible adults in the United States. As a result, Shingrix® revenues have exceeded expectations, tripling analyst estimates for 2018, its first year of commercial sales. GSK has forecast that annual revenues will exceed $600M in 2018 – comparable to the $668M in revenues generated by Zostavax in 2017 after >10 years on the market. Additionally, in 2017, the World Health Organization announced that Mosquirix® will be made available to select African countries as a prophylactic measure targeted for young children. In pre-clinical studies, the combination of HSP, peptides and QS-21 stimulates a potent memory response which is necessary for vaccine efficacy. In September 2015, Agenus partially monetized its potential royalty stream from GSK through a $100M non-dilutive royalty transaction with an investor group led by Oberland Capital. In January 2018, Agenus repurchased the obligation from Oberland and sold the royalty stream outright to HealthCare Royalty Partners.